The trip, as I had been told, was to be a weeklong endeavor involving the Grand Canyon and some vague catching up time with my father's old high school friend, Dean. My summary of the Grand Canyon to my parents was, "Don't be offended if I don't put this in my autobiography." The two days at the Grand Canyon had consisted of many sub-par buffets and a rather uneventful five hour train ride to and from the large hole in the ground we had all come with such high expectations to see. Naturally, I wasn't too excited about the six-hour car drive to New Mexico, to the land of dry air and sporadic bouts of rain and hail. Immediately I noticed that New Mexico had far superior guacamole to California, despite the fact that California is known for its avocados, and that the featured modern art galleries around town were so esoteric, there should be a corollary to Heisenberg's Uncertainty Principle that states that you can never know simultaneously what the piece of bent metal is supposed to be and what it's supposed to represent. I won't lie; I was not looking forward to our visit to Dean's house. From what I had heard of him, he adamantly refused to brew coffee (which I am completely dependent upon to play jazz) and had gotten in trouble as a kid at a summer camp for taking chicken bones and screaming that he had found the corpse of the founder of the camp. He was probably just another boring, exotic hand lotion and decorative coasters kind of adult, and even my mom expressed some distaste at the idea of spending an extended period of time at his no doubt immaculate house (little did I know it was to keep me from suspicion). We walked to the house, my mom carrying a rather large (and I thought unnecessary, as the real gift to Dean was that I had only half considered running out of his house screaming the bathroom had been infested with cockroaches the size of my fist) package for Dean, and a dog rushed out towards us along with a man I knew immediately to be Eddie Daniels. Naturally my entire world was thrown upside down; this visit to a boring old friend's house had turned out to be a visit to the house of the greatest clarinet player ever. I was speechless. He asked where the clarinet was and my mom unwrapped Dean's present to reveal my clarinet case! The next thing I knew we were in Eddie Daniels' house. He seemed delighted that I hadn't known until that very moment. When he asked what had given it away, I'd replied that it was his mustache. I was amazed I had even managed to say anything. The first thing he did was to completely change my embouchure and the way I hold the clarinet. This was going to be quite the intensive class! Mr. Daniels had me briefly play a Rose etude and said that he was impressed with my tone, to which I responded that I try to imitate his tone. I listen to one of his songs every day before I practice to really get that sound in my head. It was a corny thing to say, but it's actually true. He asked me to play one of his songs, figuring that if I really listened to his music as prolifically as I had claimed, I would easily be able to play the head of one something or other. Boy was I nervous! Admittedly I had spent quite a great deal of time playing his songs with along with him on the recordings, but I knew that with my luck I would end up messing up whatever I played anyways. I played Resolution from Homecoming and right away he caught on and started playing a counterpoint right away. I messed up on the B section but it was still amazing to play it with him in person, and he was very nice about it. I would have thought that he would be a lot more intimidating, but he was very kind and laid back. We worked on There Will Never Be Another You without the music and I stumbled through the melody, accidentally playing it in the alto key at first and then in the right key but with the wrong notes. It was one of the first songs I had learned to improvise over and I figured it would be a safe song to start with, but boy was I wrong!. I was starting to wish I had known about the surprise so that I could have prepared something for him to work on with me. Unfortunately I didn't remember the changes at all and I think it sounded that way. 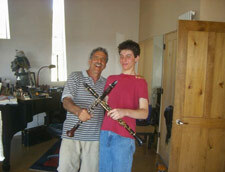 In spite of this he still taught me a great lick that gave me a new, more linear approach to playing over changes. I went home with a newfound resolution to impress Mr. Daniels the next day. I was prepared today with an Eb Real Book (no music store in the state seemed to carry Bb or a 6th edition C book) and I had played There Will Never Be Another You with Aebersold on my iPod in the motel. He asked what I practiced, the Neihaus etudes and some other jazz stuff, and told me I should play more legit music and that it was important to be focused and disciplined. He said that there was a reason most musicians were famous on a specific instrument, because true mastery of an instrument has to be done with dedicated practice independent from the distractions of learning all the woodwind doubles. When I told him that I played bari, alto, tenor, and clarinet and was planning to learn flute, he said that if I wanted to master the clarinet, I would have to make an effort to practice it much more than, if not instead of, my other woodwinds. 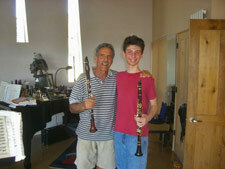 If anyone knows about mastering an instrument, it's Eddie Daniels, so I guess learning flute can wait. Hey, I'm not complaining! I played through every major and melodic minor scale on the clarinet in one sitting (standing?) for perhaps the first time in my musical career and then he played an amazing melodic minor lick that he made up on the spot. Talk about technical mastery! He wrote it down and it struck me again as a refreshingly linear approach to playing over changes, this time an alternating minor 1 to the 5, in this case from Am to E7. I heard the telltale G# to F natural and asked him if he was treating the E7 as a flat-nine chord, which seemed to surprise him. I knew that over a flat-nine chord you could play the half-step/whole-step scale of the tonic, and that over a diminished chord you could play a whole-step/half-step scale of the tonic, and often when playing chords on the piano I would substitute a diminished chord for a flat-nine chord because I'm not the greatest pianist in the world and it's easier that way, but for some inexplicable reason it had never occurred to me that the half-step/whole-step scale over the tonic of the flat-nine chord was the whole-step/half-step scale over the tonic of the diminished chord! I had learned two vital pieces of information in two days! He asked me to blow over alternating Am and E7b9 chords, which proved to be quite the challenge in its simplicity. The two chords seemed to alternate as rapidly and as subtly as the New Mexican weather, and I was struggling to differentiate between the two in my improvisation. All the theory in the world can't help you if you don't have the technical prowess to back it up! He said I was a good faker (yay?) and that I was good at playing jazz for a fifteen year old. I didn't know what to make of that. Back at the motel I diligently practiced the licks he had written out and the scale sheet he had given me and couldn't wait for what I would learn the next day. Eddie had me warm up by playing all of the major and minor scales and then I asked him how to approach learning a difficult set of changes I'd never seen before. Right away he had me play a few 2-5 licks in every key, forcing me to think as opposed to just using my ear by telling him the name of the dominant chord of the 2-5 I had just played. I had to re-figure out the lick in each key using the scale degree relative to the chord it was over and it really helped me get a feel for some of the more daunting sharps and flats. He then had me play one 2-5 lick backwards as a 5-2, as another exercise in really understanding the chords inside and out. 5-2's are much harder than 2-5's, and I really felt like I was being pushed to the next level of using knowledge as opposed to just my ear and instinct to play over a difficult set of changes. I then applied this new knowledge to a song I believe was called Lover or something along those lines, which conveniently had a set of chromatically descending 2-5's. He then made me think with a less-is-more approach, because before I had been, "boppin' around," as he called it, and he believes that, "it's not what you play, but how you play it." He had me play one note for each chord and every time we would get a few measures into it he would stop me and say not to play the flat-nine, the thirteen, the #11, etc. He had me play the chromatic line of alternating 3rds and 7ths from chromatically descending 2-5's and then told me to try making up a one note solo again, which proved to be even harder in its simplicity than the 1-5's! We went back to eight notes again and he told me to try to play a pattern over one 2-5 and then to play the same pattern a half-step lower over the next 2-5, as I had before but this time improvising the pattern, and once more I found myself having to think harder than I ever have before. What I had really wanted to do with Eddie was play Giant Steps, because that's the song everybody plays to prove that they know their stuff, or at least to show off how fast they can move their fingers. At the end of the lesson I briefly "bopped around" over it before he broke the changes down and explained the pattern of the chords. The tonics of the major 7ths form an augmented triad, dominant 7ths directly after major 7ths are a minor third away, and the tonic of the "2" of a 2-5-1 is a tri-tone away from the tonic of the major 7th chord preceding it. Wow. For homework he told me to practice playing the 1-3-5 for every chord. This was the final lesson I would have with Eddie. I was very excited, and as this was quite possibly the last time I would ever see him I wasted no time getting straight to the good stuff. I asked him what I would have to do to fulfill my goal to become the greatest jazz musician ever. He asked me why I wanted to be the greatest jazz musician ever, which really surprised me, coming from one of the greatest jazz musicians ever. I still can't really put words to that sort of drive I have, like an inner fire that has absolutely nothing to do with my desire to bring up casually at parties that I'm the best ever at something. I couldn't really put it to words then either, so I told him it was because I wanted a nice house like his. He laughed and said I should be in real estate instead if that was really why! Then he stressed the importance of mastering the instrument and of being a flexible musician with a technical mastery that can only come from extensive practice of the ever-demanding classical side of music. He had me play through an etude and then played it brilliantly himself, and we worked on several exercises for control, focusing largely on smooth transitions between notes, a steady and pure tone, and even lines; some of the things that set him apart from all the other jazz clarinetists. He gave me some slick new fingerings for some of the tricky high notes and he had me play some difficult intervals, putting my new knowledge to the test, before we went to playing some jazz. Since Giant Steps had proven to be quite the task, we stepped back and played over Autumn Leaves, ironically enough. I'll leave that first entry the way it was for laughs. Looking at his website I realize now that every kid and his mother asked to work on Giant Steps with Eddie. I guess that's just the song to play, you know? Especially if you want to show off to your friends. I was hearing the chords fine, I guess, but the notes just didn't seem to fall into place, and Eddie asked me what I was thinking when I looked at a set of chords. I replied that I was mostly looking for the line 3rds and 7ths as a way of keeping my bearing and making the changes, and for someone who had spent the last three days giving me linear licks that accented the notes of the chord, he told me that I shouldn't think so mathematically about just those two notes, but should think about the scale that corresponds with each chord. This makes a lot of sense, as it immediately gives me six or so more notes to play; the interesting notes aside, and the changes of perspective was a bit freeing. He had me play a little riff over one chord by giving me the scale degrees and had me transpose it over every chord, forcing me to actually think in the scale by converting 1-2-3-4-5-3-2-1-4-3 into a series of actual notes every measure. He seemed to tell that I thought that playing the same lick over and over, over each chord, hardly made for an "Eddie" quality solo, but he wanted me to demonstrate a command of the changes, and not just play around in A minor. I hadn't really thought of myself as doing that, but when he said it I realized that I was missing some of the key harmonic concepts that would show I knew exactly where I was at all times. It was, admittedly, a bit frustrating that the only two apparent options for me at this point when I want to stand and do a solo are to take the 1-2-3…1-2-3…1-2-3 approach or to do a solo that isn't worthy of Eddie's approval, but I guess that's what practice is for. I'm sure there was a frustrated -or at least dazed and overwhelmed; this is Eddie Daniels, after all- look on my face, because he kept asking me what I was thinking. I feel somewhat guilty because I didn't really have an answer for him and I think he expected something profound, but all I said after three tries to put the music and the theory and everything that had happened in the past four days swimming in my head to words I managed to say rather stupidly that, "Everything's just…happening, you know?" I know that doesn't really make sense as an answer, and I don't even really know why I said it, but I think I was trying to convey the sense that I was in Eddie Daniels' house and living in the moment of something I knew I would remember for the rest of my life. Part of me wanted to just stand there and take in the features of Eddie's face and his workshop, the many assorted barrels on the desk of various shapes and sizes, the Hercules stand in the corner of the room, the mirrors, the windows looking out to a beautiful New Mexican sky, or clouds, in short, everything. Of course there was learning to be done, but I wanted to cherish the moment a bit and not just rush through and walk out thinking, "Woah, that went by fast!" Well, it did. No matter how hard you try to savor it, four days is a mere grain of sand upon the shores of life, and although I have vivid images in my mind of his couch, polished wooden floors, coffee table, and Maxine, they can no more take me back in time than the sweet sound of his clarinet. What I hope will have made a more lasting impression on me than these images, however, is the drive to practice and excel he instilled in me. I have only been playing jazz for two years, so perhaps in a couple years' time I'll have the experience under my belt along with the ear and the theory that I'll need to play good jazz. I am enthusiastic both to practice until I've worn the gold off of my Hamilton keys and to keep listening to jazz, Eddie's albums in particular. I'm really grateful both for Eddie's kindness and generosity with his time and talent and for my parent's support and encouragement in whatever crazy thing I've gotten myself obsessed with this month. I'm just saying, an album with Eddie Daniels and Kenny Garrett would be pretty cool. 8/26/09: Master Class in Review. Don't Worry, it's Short…ish! I was supposed to send this to you? Whoops, sorry about that! But I might as well take this time to say what the month after the master class has been like. I've been practicing the clarinet for two hours every day, which I think is a big improvement over zero, along with my usual two hours of sax. I know he wants me to focus in on one instrument, but that really isn't practical, seeing as I play saxophone in two big bands and two combos. I'm still using that as an excuse to not practice the flute though! 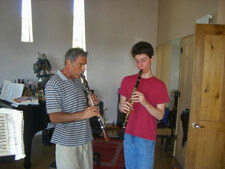 I did notice gradual improvement in my control of the clarinet, especially over "Eddie's Slo-Mo" exercise. I have drastically reduced the amount of squeaks going from one extreme of the horn immediately to the other, and my tonguing speed, control, and accuracy has increased quite a bit from the classical etudes I've been playing. The most important two things I learned were definitely "one-stop shopping," where I don't roll my lip out when I put the mouthpiece in my mouth, and thinking about the scale I play over the chord rather than just the notes in the chord. I feel much more free when I solo, even if I don't venture into the world of extensions and polytonality, because I have eight or so notes that definitely work as opposed to four. I know, I know, I'm repeating myself. But I don't when I solo! I'm finding more and more that I enjoy playing classical music. Before, I would just say that to humor the people that cared about me that keep trying to shove it down my throat, but now I can confidently say that it's right up there with smooth jazz in regards to how much I enjoy it. In other words, I like it, but I don't tell my friends that I like it. After all, I want to keep the small scraps of respect I've earned as a "strictly illegit" player.